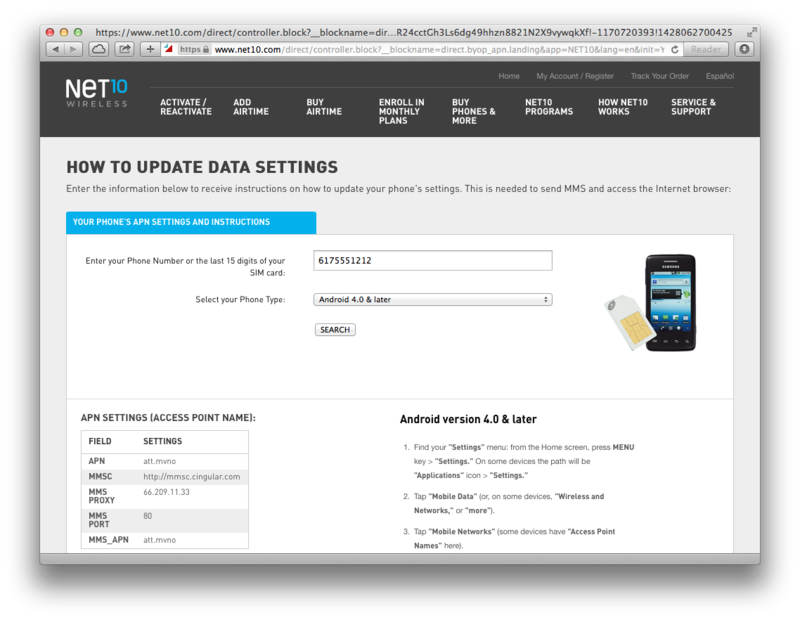 This guide explains how to look up the APN settings for your Net10 Bring Your Own Phone (BYOP) phone. You need to set the correct APN settings in your phone for your cellular data, MMS picture messages, and group texts to work properly. While Net10 has many pages on their web site documenting their different APN settings, they actually have a web site where you can look up the APN settings for your phone number. Follow the steps below to look up your Net10 APN settings. This instructions and this Net10 website works with Net10 BYOP phones using Net10’s ATT and TMobile networks. The Net10 website does not work for BYOP Verizon or Sprint phones using Net10’s Verizon or Sprint CDMA networks. 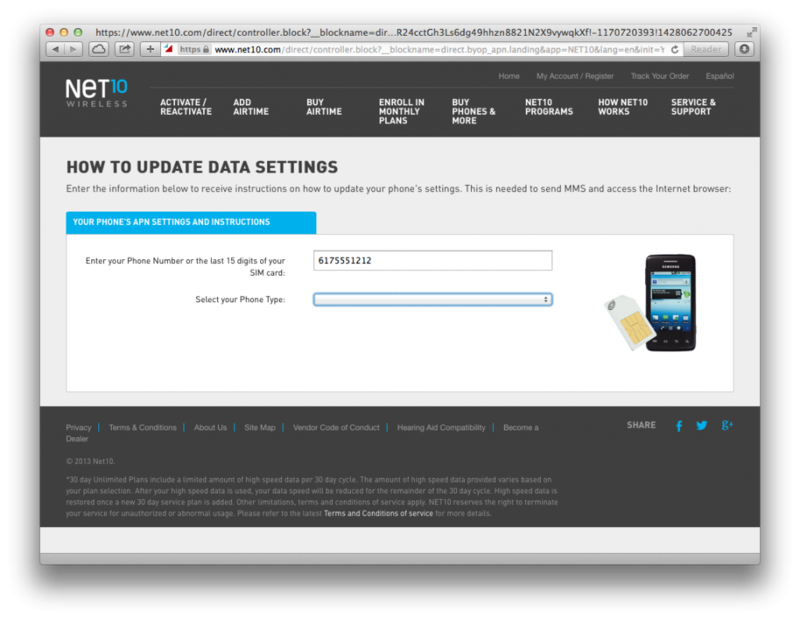 The web site doesn’t always work for phones purchased from Net10 either. I’ll add a link here after I write an article for those using Net10 phones and BYOP CDMA phones. While you can lookup your APN using the browser on your mobile phone, the web site is easier to read on a computer or tablet. For most people, your phone will use one of three different sets of APN settings. Look in the bottom left corner of the webpage to see your settings. Your APN should be one of the following: tfdata, att.mvno, or wap.tracfone. See below. To set up your APN, you usually need to enter these APN Settings into the APN settings page on your smartphone. Note, that the APN settings field names listed here, won’t exactly match the APN Settings field names on your smartphone. Check out the steps in one of Smartphonematters APN Settings Guides or APN Settings Help. If the web page, did not return any APN settings for you, your account may not met the conditions I described earlier. That is, you are using a phone purchased from Net10 or using a BYOP Verizon or Sprint phone on Net10’s CDMA network. In that case, leave a comment for help. In some rare cases, you might find your APN is something other than tfdata, att.mvno, or wap.tracfone. In that case, leave a comment with your APN settings for help. Thanks for the reply, Bob, concerning my Net10, Verizon Nokia Lucia 929 issue. Net10 walked me through the activation process and the phone works well for calls and text messages; just won’t handle a data exchange. The sim card for Verizon/CDMA that came in the BYOP package was used in the activation process. I was told that the APN was automatically set. Thanks again. Did you activate that on Net10’s att, tmobile, or verizon network? Did you set the APN? My alcatel onetouch phone is always been the same , here past few days my data has not been working most places , in my apn settings it says it’s not allowed for this user . Pls help . My phone is whats makes me money and I have plenty of data I just bought . You did not say which specific model phone you have or if you know if it is using Net10’s AT&T or Verizon Network. If you tried to look up your APN on net10.com and it didn’t return any apn information, you may be using their Verizon network. I’, not sure what you mean by not allowed for this user.. is this something you are seeing on the phone. I hope you still look at these. My cousin got a friends Iphone 5. We got him a new SIM from net10 and everything was fine, Texts phone data all worked. To keep his phone number we set the phone to the zipcode in PA, while he was here everything was fine. He went home to TX and on his layover in Orlando everything was fine. Data text phone. Everything worked. He got to TX and texts and phone work but data does not. It has been 3 days and they have called net10 15 times with no help, they keep saying they will text him new APN settings but the text never comes thru. I read these comments almost every day. Do you know which net10 SIM you used in that iPhone 5? was it the Net10 AT&T, Verizon, or T-Mobile SIM. He will need to figure out if that network works well in this area. That could be one problem. You can have him try resetting his network settings, Resetting Network Settings on Your iPhone. If he is using their verizon network have him install http://ivzwentp.tracfone.com on his iPhone from the Safari browser on the phone. I know it was a verizon phone so he used the sim for verizon. what type of phone do you have and which network are you using? Hi. I have a Galaxy s6 that I took over to Net10 from Verizon. I can’t get mms to work. I used it on my old iPhone from Verizon without any issues. I’ve changed my apn settings and used the one on net10 website. Help please? Is there a way I can find out? I don’t see anything on my net10 account about it. Do you have the plastic card the SIM was attached to? What color is it? Did you follow the instructions in the article to look up your APN? What did net10.com say your APN is? Look up your APN here Looking up Your Smartphone’s Net10 Wireless APN Settings. You won’t need the username and password. Bob….Thank you.. Got it working again…. Howdy-so we converted a Verizon Droid Razr Maxx into a Net10. Everything ran fine except it wouldn’t allow picture messages. Fixed that issue but now it won’t go online period.. Please HELP! Which Net10 network are you using? I have a Verizon phone and need the apn info for that. I’m on net10 please help. Problems with Straight Talk Wireless’ Verizon Network should work for net10 to. i have a samsun galaxy note 2 from sprint everything works but no data, cannot get to the apn settings what do i need to do? you are using Net10’s Sprint network? Why do we need to ask about vzw apn. I am in that boat. and the straight talk app should work for Net10, if that is the problem. Hi, I have a Verizon LG G4, I have everything working except for the MMS. What am I doing wrong? It may not be you. Are you using Net10’s Verizon network or their ATT network? Are you having problems sending or receiving MMS or both? That isn’t enough information to try and help you. Have you heard of the settings changing lately and it you have, if it’s a stable APN? I haven’t updated this page in a while. Both should still work. I’d use the RESELLER one if it works for you. Its the newest one they want to transition too. Me too. I am on att with my zte whirl which is net10 branded and I was having difficulty with my data connection. Everything working now with these settings! Hi I have a phone that was byod from Verizon but the only thing not working is mobile data. You don’t set the APN for BYOP phones using Net10’s Verizon network. The phone sets them automatically. What is the problem you having? I have an HTC One M8 that’s a net10 phone running on Verizon. My data works just fine, it doesn’t get 4g but it gets +HSVP. The problem is I don’t get MMS. I’ve tried everything and it doesn’t work. I need help. You can’t directly set the APN on a phone using Net10’s Verizon network. This is supposed to happen when the phone is activated. You might want to try calling Net10 support for help. You really want to get your call transferred to level 2 support for chance to get help.